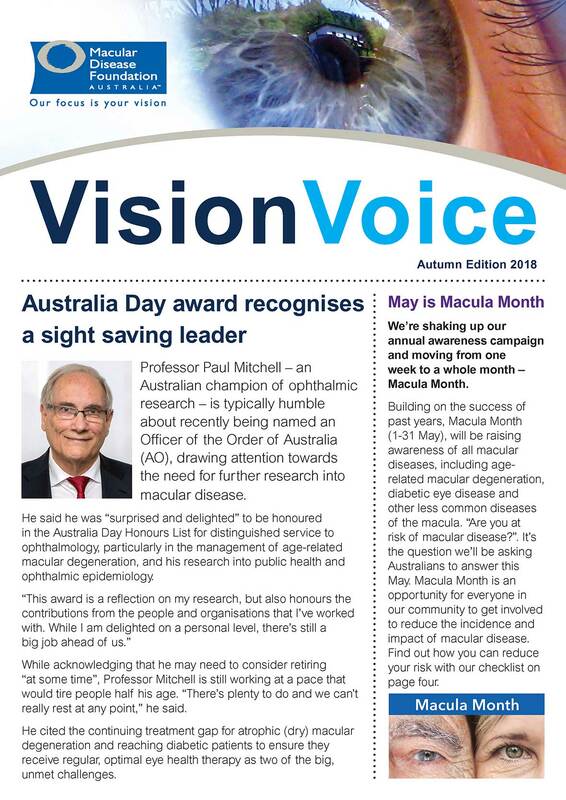 Vision Voice Autumn 2018 is the new look newsletter for the macular disease community. This edition leads with a story congratulating Professor Paul Mitchell, a champion of ophthalmic research, in being named an Officer of the Order of Australia (AO) in the Australia Day 2018 Honours List. Mythbusters shines a light on Diabetes and Eye Tests; Technology and You features wearable devices; Healthy Choices introduces our Macula Menu; Eyes on Research gives you a roundup of the latest in research into macular disease; and Our Community provides a glimpse of living with macular disease and highlights some outstanding community support.